All the questions from the aforementioned TTN are below (well, not the music ones). The answers are there, but you need to highlight them to see them. Not too hard, and not too easy. Just right. We’ve received emails asking about the questions for the Twilight Quiz this Friday. Are they hard? Are they easy? Here are some so you might get an idea. These are ones that didn’t make it in to the quiz! So don’t go thinking they’ll be asked on the night. Oh and also, some bad news. So many teams have registered we’ve had to close registrations. The room is only so big and if too many squeeze in it might literally drop onto Harris Street. There are that many Twilight fans! Sorry. Anyhoo, here are those questions. The answers are in white text so you will need to highlight them to read them. Don’t cheat though! 1. Which of Bella’s Forks classmates talks to her first? 2. What sort of car does Rosalie drive? Answer – Red BMW M3 convertible. 3. What is the name of Sam’s girlfriend? 4. What is the first name of Bella’s stepfather? 5. What’s the name of the Volturi receptionist? 6. Which British actors play the Volturi vampires Aro and Caius? 7. What is the name of the band from Franklin, Tennessee who wrote 2 songs for the Twilight movie and what are the names of the songs? 8. Who sings ‘Tremble for my beloved’? 9. What song by Muse plays during the baseball scene? That’s right, Twilight the musical can be watched online. It’s not official! It’s a parody, in fact! Which means you mightn’t like it (apparently it becomes funnier after the first episode). Oh and you will need broadband probably. Oh and don’t forget to register for the Twilight Trivia Night. It’s in, like, three weeks, and you will need time to work on a costume (it’s on the night before Hallowe’en, so why not come in costume?). Thank you to Kristina and Matthew for starring. Remember everyone to register, it promises to be a fun night! Register now for the Twilight Trivia Night! 06.10.09 | Permalink | Comments Off on Register now for the Twilight Trivia Night! Registrations are now open for the Twilight Trivia Night (Friday 30 October, 6.30pm, Central Library). Enter your team (or yourself) here for your chance at glory and prizes. What’s the Twilight Trivia Night? It’s like a pub quiz but without the pub, and focusing on facts and trivia to do with the Twilight saga by Stephenie Meyer (the books, the movies, the music, the hysteria, the sparkles). According to the posters it’s the quiz “you can really get your teeth into.” Ha ha ha. We know there are some Twilight experts out there and we want to find out who you are! Of course non-experts will have the opportunity to duke it out for a special tactical non-expert award, so don’t be put off! Register now! But wait, there’s more! If you send in a team image we’ll turn it into a team badge for you. 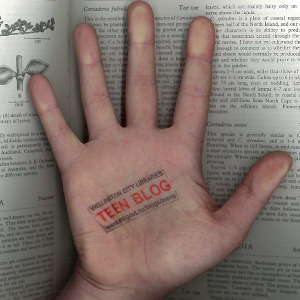 Email your image to teenblog@wcl.govt.nz. The badges are round and 5.5cm across. Here’s a poor diagram to help you visualise it. Anything is fine, pretty much. Quick update: for ages 13 to 18 (inclusive).